Australian author Mem Fox has written so many gems over the years. Here is one she wrote years ago that would be a great story for worship settings. 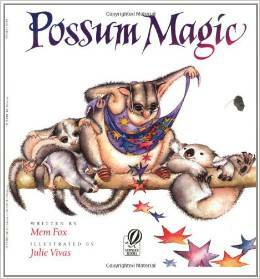 In this tale, Gra ndma Poss uses her magic to make the kookaburra pink and the wombat blue. For her little possum friend, Hush, she does something extra special. She makes Hush invisible. Hush has all sorts of adventures in her invisible state, but what Hush really wants is to be seen. The trouble is, Grandmas Poss can’t exactly remember the recipe to make her visible again. This is a fun story with charming characters presented in a gentle and playful way. The story speaks to the basic human need to see and be seen and holds the potential to mine all sorts of themes around theology, community, and self-worth. Mem Fox’s flowing verse and splashes of rhyme work well with the delightful and delicate watercolor illustrations. Perhaps in part because the illustrator was depicting invisibility, the illustrations may be hard to see from a distance. The picture book would work best with a small group or with a projection of the images. Telling the story is a great option, though would require a little work to capture the flow and rhyme Mem Fox uses so well.